The team at CE Rose is the reason why the school is so successful year in and year out. Newly appointed principal Alma Carmona-Alday plans to continue to build upon the foundation of excellence that former principal Stephen Trejo and the staff have created. It starts with organization and is enhanced by the imagination to cultivate a clear message that each member of the staff resonates to the students, parents and entire Rose community. That process requires extra work, such as the professional development sessions the staff at CE Rose engages in during the first week of summer recess. Staff members put their vacation plans on hold so they can workshops on ways to engage their students and parents, ultimately making their school better. 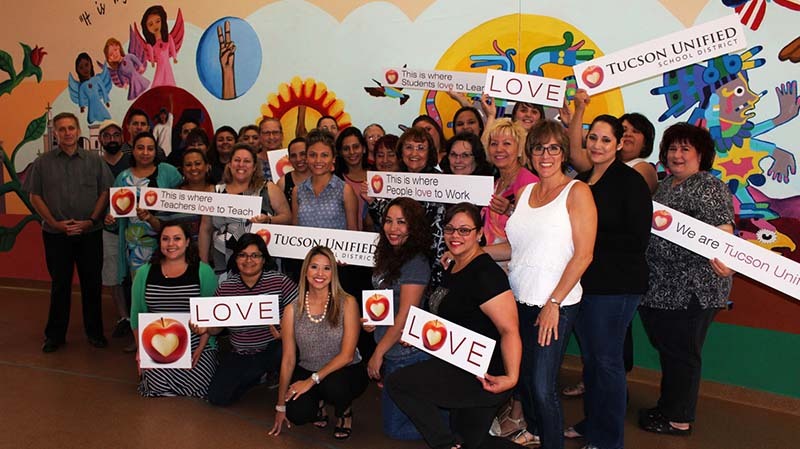 Here's what the members of this team have to say about why they love being part of #TeamTUSD. Cece Alday, Counselor: I love working here because this is a challenging, yet rewarding place. It keeps me on my toes. Nicole Ball, 1st grade teacher: I am at CE Rose because the children of this community deserve to be challenged and taught to be their best, and because their parents deserve to be as proud of them as they can be. Lourdes Cirerol, 5th grade ELD: The CE Rose school community has provided high quality education to the children in the southside community. It has positively impacted the families in the school community by empowering and supporting students to reach their potential. As a result, students are doing what one day was considered impossible – they are pursuing higher education and they are true community leaders! Alicia Darden, 2nd grade teacher: What I love about CE Rose is the dedicated faculty and staff. We inspire and support each other and the students to reach high expectations. Adam Duarte, 7th grade teacher: The reason I love working at CE Rose is because there is such a high level of trust between administration and the teachers. Britney Goglio, 7th grade teacher: I love working at CE Rose because of the community. The staff and students at Rose are amazing. They make coming to work every day fun! Nicole Handford, 1st grade teacher: I love the CE Rose community. The dedication the staff and students have to learning is amazing. It is definitely a wonderful place to be! Isabel Hanna, 4th grade teacher: I love to work for CE Rose because we all work as a team to ensure our students are successful and better prepared to have a bright future. Go Team Rose! Carol Kennedy, 8th grade teacher: I love working at CE Rose for the community feel. Love, laughter, learning! Albert Olivas, 8th grade teacher: I am at CE Rose because of the people I work with. They have been my biggest support team and they accept me for who I am. I can be myself. After 21 years, I'm still here! I love the students. Mary L. Potter, 3rd grade teacher: I have high expectations for all my students and myself! Cinthia Quijada, Para-Professional: I love being at CE Rose because not only do we focus on academics, but we work on the students as a whole. We invest deeply in our students and in the end it pays off for everyone. Jennie Ratliff, 4th grade teacher: I love working at CE Rose because we care about our community, students and staff. Janet Retes, 1st grade teacher: What I like about CE Rose and #TucsonUnified is working with students to achieve their potential. Karina Sanchez, 1st grade teacher: I enjoy working in a cooperative, friendly, caring environment at CE Rose. Angel Sobrino, 7th grade teacher: I love working here because the kids are hard working, and the teachers are respectful and strive to be the best. Marcia Wolf, LSC: To work at CE Rose is to work in an environment of mutual respect, high goals for achievement and the implementation of the Leader in Me program. All stakeholders are involved – students, families and school staff. I love my job!